Nothing big to update on, I went to the junkyard and got some parts off a 2002 that was there. 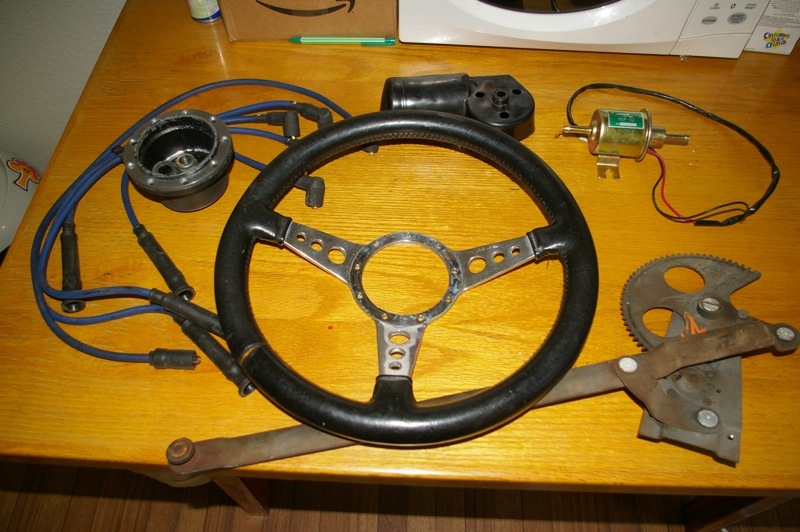 Moto Lita steering wheel with 2002 hub (I forgot the horn button, ugh), window regulator, cover for the windshield wiper motor, spark plug wires and coil wire from Ireland Engineering (hey it was $5 for the set), and some kind of inline fuel pump. Before I could even tell them it was a fuel pump, the cashier said “fuel filter” and charged me $2 for it. I think it’s a Carter because it’s galvanized gold and has a green sticker but Googling the part number yields nothing. For $2 I don’t care either way. You are currently browsing the SPAGHETTIBLOGGER blog archives for October, 2008.